This contemporary style house was designed with a long drive way made interesting with Landscape. Long passage in the front leads the house. 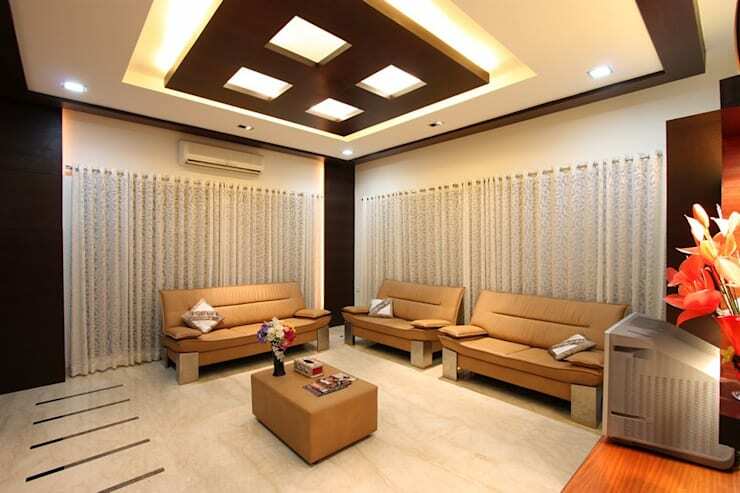 This passage helps to cut down the noise and air pollution of centrally located house in the metro city of Chennai. 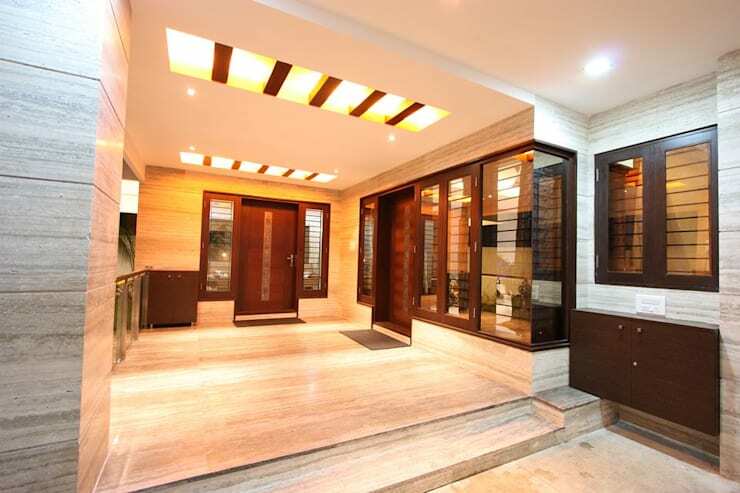 The house contains 6 Bedrooms, a master bedroom, a kid’s bedroom, a study room, a living room, a family room, a dining room overlooking a beautifully designed courtyard, a modern kitchen and a terrace garden. 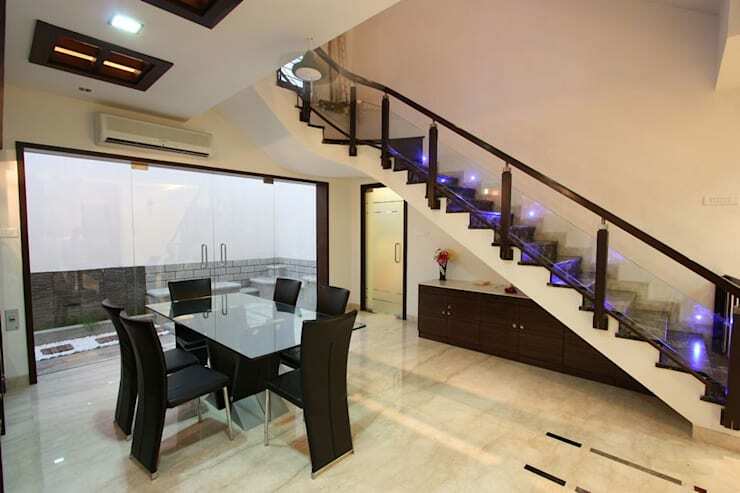 Interior of the house is designed in sleek and contemporary style with the use of rich veneers for a luxury feel. 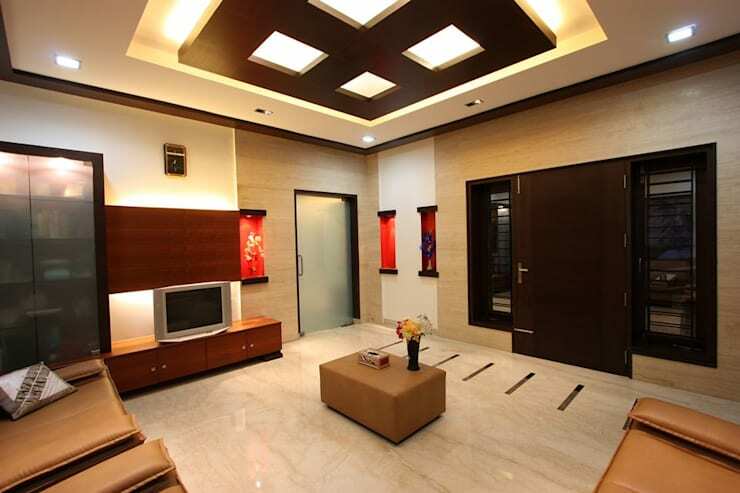 Marble cladding in the common areas like living, dining, and family rooms helps in easy maintenance. Each room is designed to suit the personality of the occupant with large French doors and contemporary 'Sitting Window' which provides a special place for children and younger adults to sit and read or enjoy a panoramic view of the outside. 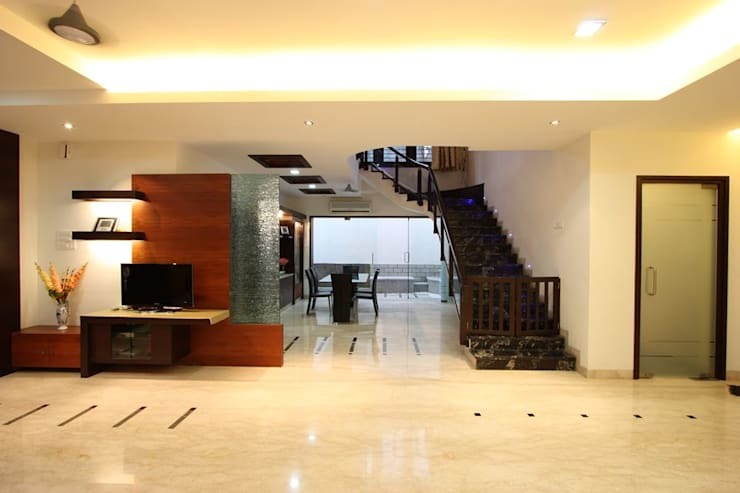 ["IN"] [Published] An Indian home like no other! 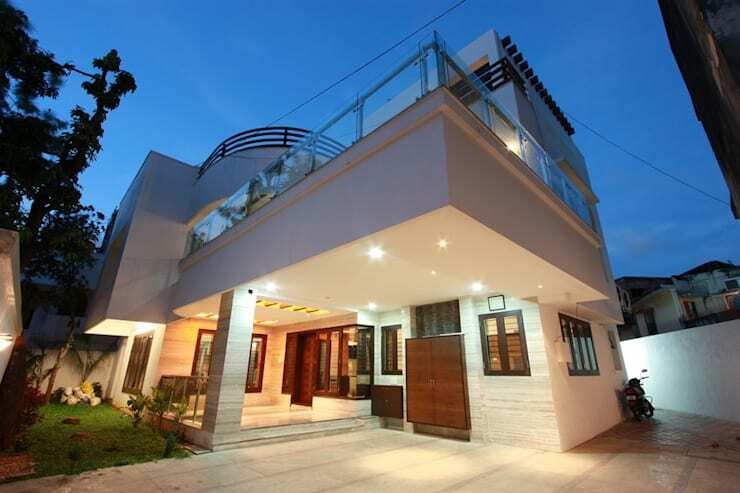 Exterior view of the house has been designed in simple white finish with glass and wooden handrails at different levels for a contemporary look. 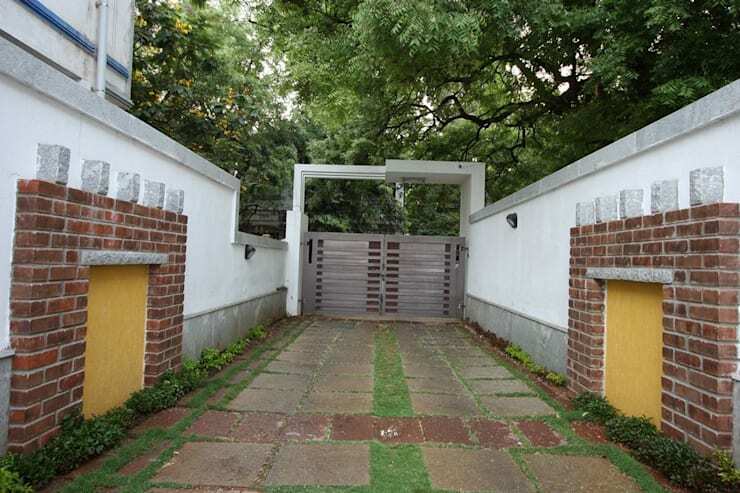 Main gate with long passage which leads to the house has been designed with interesting feature on the wall with rustic brick finish, insulates the house from the hectic traffic noise and pollution of the city. 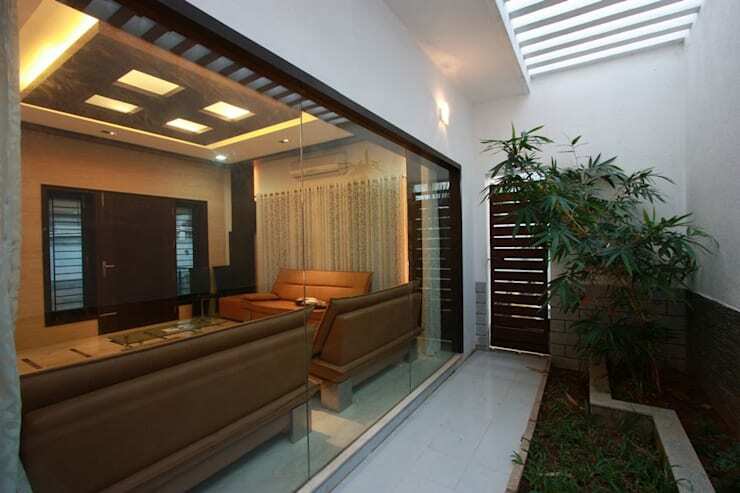 View of veranda and the main entrance which looks bold and bright with its false ceiling and conceal lights. Drawing room in the front has a simple yet rich look with the use of dark shade veneer and marble cladding on the entrance wall. Large windows draped with elegant white curtain merges with the wall creating an interesting look to the L shape wall in this drawing room. Curtains in the drawing room open up to a large glass partition for courtyard view outside. 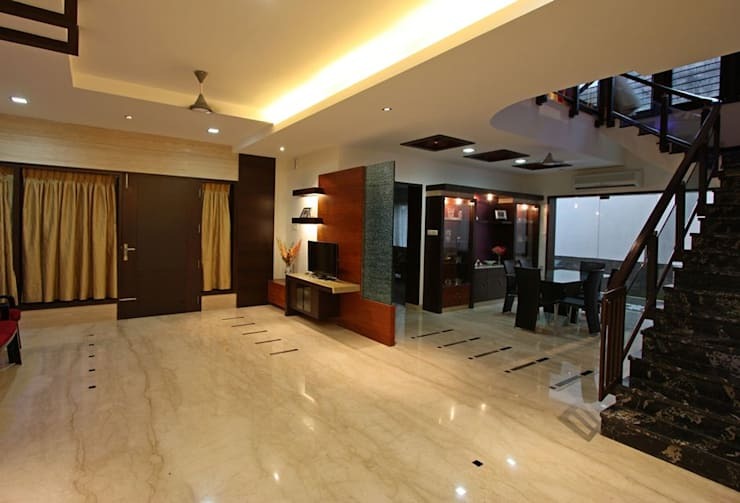 Living and dining rooms have a light colour marble with similar marble cladding on the walls giving a very spacious look to the over all interior of the house. 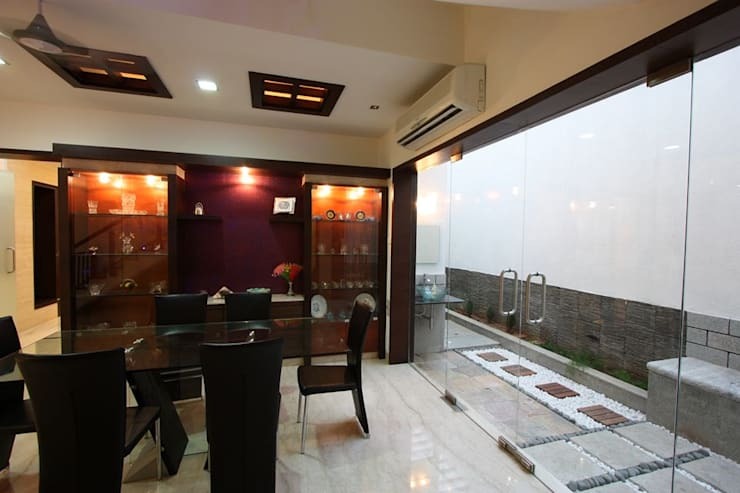 Dining room opens up to the courtyard area with clear glass doors and partition. Handrails are designed with sleek wooden vertical post in combination with glass and top rail that matches with the veneers.